Make 2018 the year you learn to handstand! Upside down yoga postures can be fun, challenging and daunting all at the same time. In this workshop we'll concentrate on handstand: newer students will begin to experience what this posture is like and more experienced practitioners will be able to experiment with variations and different transitions. Warm up your body with a steady vinyasa flow yoga practice. We will increase mobility in key areas of your body such as shoulders, hips and hamstrings, and learn to engage the muscles that will support you in your handstand. Then expect plenty of time to experiment with going upside down in a fully supportive environment. Towards the end of the afternoon we'll cool down steadily and finish with a guided relaxation. Suitable for all levels except those completely new to yoga. But all levels of handstanders are welcome, from beginners up! Do I have to be able to do a handstand? No – that’s the whole point of this workshop! Attendee numbers will be strictly limited meaning you will be fully supported by your teacher and other attendees as you learn to take more weight on your hands. You will leave with tips and techniques to practise at home to gradually build your strength, mobility and confidence. This workshop is open to everyone except those completely new to yoga. Anyone that has some experience of vinyasa yoga and wants to build confidence in inversions! Yoga students will learn under the watchful eye of an experienced teacher, while yoga teachers or teacher trainees will pick up tips on how to sequence classes for inversions plus strength and mobility drills and techniques to use in their own classes. Book before 3 February to take advantage of our early bird rates. Or bring a friend and each get 10% off! Click here to book your spot (how to: after login make sure you are in the 'classes' tab, then use the little calendar to navigate to 3 March 2018. Click 'sign up now', then 'make single reservation'. Then follow the simple steps to payment, choosing either to book just for one person or for you and a friend). What should I bring? All mats and props will be provided. Just bring yourself in comfy clothes that don't restrict your movement, and maybe a water bottle! How do I get there? If you search for 'Yoga with Olivia' in Google or iPhone maps our Mitchell Street location should come up. Or from Old Street tube station take the orange exit (exit 4) directly opposite the ticket barriers, signed to Clerkenwell and St Luke's. After a minute or two turn right off Old Street on to St Luke's Close, then right again on to Mitchell Street. We have a black front door with number '45' on it. Press the buzzer for flat C and we'll let you in - we're on the second floor. Since our buzzer sounds in the studio please don't press it once the workshop has started! How do I book? Click here to book your spot (how to: after login make sure you are in the 'classes' tab, then use the little calendar to navigate to 3 March 2018. Click 'sign up now', then 'make single reservation'. Then follow the simple steps to payment, choosing either to book just for one person or for you and a friend). We'll be returning to the wonderful Casa Yoga Milano in spring 2018 for more alignment based flow and study of technique in inversions and arm balances (and probably laughter at my terrible attempts at Italian...). Watch this space for more details! UPDATE 23/11/17: this retreat has now sold out! if you'd like to go on the waiting list in case of a cancellation, or to know first about our next retreat please let us know. This retreat will be the perfect way to shake off the winter and step into summer with a dose of warm, replenishing Andalucian sun. We will practice yoga morning and evening on a shaded balcony with stunning views over the neighbouring hills. During the day take the time to explore the local area, relax with a book, have a massage or even just take a nap in the warm sun - do as much or as little as you please! We will have one free day mid-week, allowing those that fancy it to venture further afield; perhaps by heading to the beach, climbing to the higher slopes of the Sierra Nevada mountains, or visiting the spectacular Alhambra palace in Granada. Our venue is based on the edge of the Sierra Nevada national park within easy reach of both Granada and Malaga airports. There's only a small single supplement so it's ideal for solo travellers, and there's also the option to bring along a non-yogi friend or partner at a reduced rate. All our previous retreats have sold out well in advance. So to secure your spot with just a 25% deposit click here! (how to: after login make sure you are in the 'classes' tab, then use the little calendar to navigate to 19 May 2018. Click 'sign up now', then 'make single reservation'. Then choose the room type you'd like to reserve and follow the steps to payment!). We'll practice yoga morning and evening. Start your day with an energising but mindful vinyasa practice on our shaded balcony with stunning views over the foothills of the Sierra Nevada mountains (the photos here don't really do it justice!). You'll set yourself up for the day ahead by moving in time with your breath, and strengthening and stretching all your major muscle groups. Classes will be strictly limited to 10 people so there will be ample opportunity for personal attention, and to deepen your practice by learning how to adapt the postures to best suit the needs of your own body. Each evening we'll wind down with calming and grounding practice drawing on yin and restorative styles of yoga, rounded off with a guided relaxation. You'll float out of our evening sessions feeling relaxed, renewed and restored. In addition, we will also practice some simple meditation and breathing techniques that are perfect for keeping that relaxed vibe going even after you get back home to real life. Alongside our gorgeous balcony, we also have a bright and airy indoor yoga space available for use. Our tempting meals will be prepared with an abundance of fresh, seasonal and local produce. Our hosts grow their own organic vegetables, and fruits for jam making. They are renowned for their delicious food and hospitality, so you can rest assured you will be well looked after. Artisan cheeses, wines, olive oil and honey are all produced in the local area. After working up an appetite on your mat, breakfasts will be a feast of fresh orange juice, cereals, fruits, yoghurts, breads, cheeses and honey from Jose the bee-keeper. And round off the day with a delicious 3 course dinner. Our chef creates exquisite meals using fresh, local ingredients, with the optional accompaniment of wines from independent vineyards across Spain. In addition, on one evening we will venture out to sample your choice of the varied local restaurants. Our accommodation is a 400 year old mountain villa that was once an important family home with a wine press, olive oil store, barns and stables. It has now been transformed into stylish and comfortable accommodation with south-facing terraces, a garden and spectacular river gorge views. The old Alpujarra-style buildings are arranged around a Moorish courtyard garden, planted with fragrant wisteria and roses. A few steps through the garden take you to the terraces with breathtaking views along the valley and into the mountains. In the chic yet simple bedrooms they’ve kept the original chestnut beams with white walls and terracotta floors, and added comfortable beds, quality linens and a scattering of rugs. The bathrooms are modern with rain showers, huge mirrors and hand-made tiles inspired by the Moorish designs of the Alhambra. A large sitting room opens out on to our shady yoga terrace, which has stunning mountain views. We'll be based in the stunning Las Alpujarras region of southern Spain. Situated between the Mediterranean Sea and the snow-capped peaks of the highest mountains in Spain, this is an area of spectacular natural beauty. The region is famous throughout Spain for its lush vibrancy - its terraced farmlands are constantly watered by the melting snow from above, giving a high altitude oasis of greenery that stands in dramatic contrast to the arid foothills below. Pine forests on the higher slopes give way to chestnut, walnut and cherry trees. A little further down olive groves and vines flourish, while lower still orange and lemon groves fragrance the air, and finally cede to pomegranate and quince in the valleys below. The local region is renowned for its stunning walks and hikes. The Alpujarras and Sierra Nevada (covering over 3,500 sq km) are criss-crossed with goat paths, mule tracks and old silk roads, taking you through breathtaking mountain scenery and historic white villages. The area is home to over 2000 plant species, 60 bird, and 270 butterfly and insect species. The landscape, wildlife, and sun-bleached traditional stone villages make it a photographer's paradise. Despite this retreat's serene and secluded location there are markets, a swimming pool, local bars, restaurants and shops all nearby. One day mid week will be a free day after breakfast, allowing you time to explore further afield if you wish. Choose to venture into historic Granada to shop in the souks and marvel at the spectacular Alhambra palace; head to the beach; explore local villages and hike higher up into the mountains or maybe just relax with a book in the flower-filled garden of our villa. We also have an excellent English-speaking local massage therapist who can visit us on site. NB. Where a deposit is paid, the remaining balance is due by 10 February 2018. Payment plan available upon request. Arrive on Saturday 19 May and depart on Saturday 26 May 2018.
lunch (we find that after a big breakfast and with a substantial dinner in the evening guests prefer a very light lunch. You can easily shop for wonderful local fruits and vegetables, fresh bread and healthy snacks and prepare them in our own kitchenette during the day). Most international flights land at Malaga airport. Airlines operating daily direct flights to Malaga include Easyjet, Ryanair, British Airways, Iberia, Bmibaby, Flybe, among others. You can also fly with British Airways from London City to Granada airport (90 minutes away). There will be a group taxi transfer to our villa departing Malaga airport on the Saturday afternoon of arrival (19 May 2018). If you are flying into Malaga please book flights that arrive before, but as near as possible to, 15.30. On Saturday 26 May book flights that leave Malaga after 14.00 (taxis will leave our villa at 10.00 and arrive at Malaga airport at about 12.30). The cost for this will be split between all passengers and will be around £25-30 per person. The journey time is normally about 2 hours from Malaga airport. Absolutely, lots of guests on each of our retreats arrive independently. There is always a warm and welcoming atmosphere with communal activities available, plus ample opportunity for you to take some quiet time for yourself too. Also, this is the perfect retreat for you as there isn’t a large single supplement for you to have your own room. We will eat our meals together and people often group together to go on trips, take a walk or just have a chat. But everyone is also positively encouraged to take time to themselves to read, take a stroll through the gardens, go on a solo adventure or just nap in their room. Numbers will be limited to a maximum of 10 people, so lots of opportunity for individual attention. All our previous retreats have sold out well in advance but you can secure your spot now with just a 25% deposit. Click here to use our online booking system. After logging in make sure you are in the 'classes' tab, then use the little calendar to navigate to 19 May 2018. Click 'sign up now', then 'make single reservation'. Then choose the room type you'd like to reserve and follow the steps to payment! Of course! You can email Olivia directly at yogawitholivia@hotmail.com with any questions you might have. Round off your summer with a dose of Moroccan sun in our gorgeous luxury villa just outside Marrakech. Practice yoga morning and evening in our shady practice area overlooking our private gardens; relax in our beautiful grounds or take a dip in the pool; enjoy delicious local produce for brunch and dinner and maybe take a trip to a Marrakech souk or explore the Atlas Mountains. 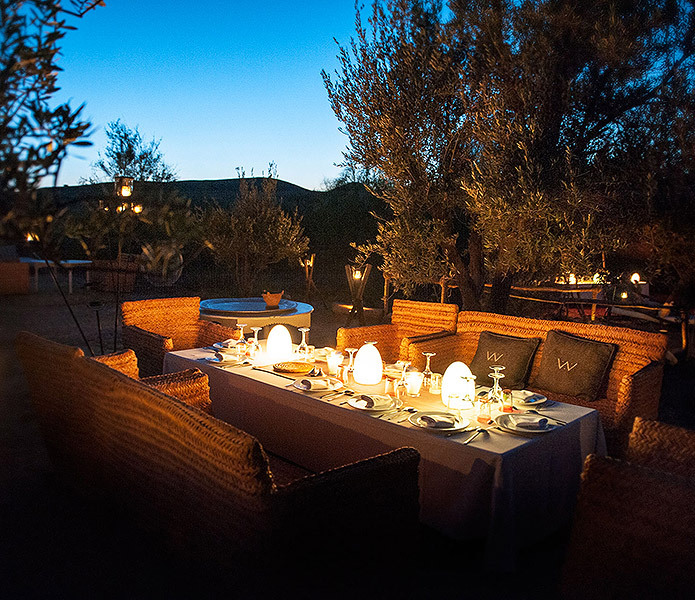 On our last evening we will venture into the stone desert near to Marrakech for a sunset yoga practice in the wilderness followed by a traditional dinner under the stars. Return home feeling revived and rejuvenated! Our last retreat sold out more than 6 months in advance. So to secure your spot with just a 25% deposit click here! (how to: after login make sure you are in the 'classes' tab, then use the little calendar to navigate to 28 September 2018. Click 'sign up now', then 'make single reservation'. Then choose the room type you'd like to reserve and follow the steps to payment!). Each evening we'll wind down with a calming and grounding practice drawing on yin and restorative styles of yoga, rounded off with a guided relaxation. You'll float out of our evening sessions feeling relaxed, renewed and restored. On our last evening we will venture into the stone desert near to Marrakech for a sunset yoga practice in the wilderness. In addition, we will also practice some simple meditation and breathing techniques that are perfect for keeping the stress free vibe going even after you get back home to real life. Then after our evening practice round off the day with a delicious 3 course dinner. On our final evening our dinner will be served under the stars after a sunset yoga practice in the desert. Expect vegetable tagines, Moroccan salads, vegetable gratins and soups. Moroccan cuisine is famous for a large range of Mediterranean fruits and vegetables, argan and olive oils, and flavours from an endless range of herbs and spices such as cinnamon, cumin, turmeric, coriander, saffron and mint. Fruit, nuts and soft drinks will also be available throughout the day. 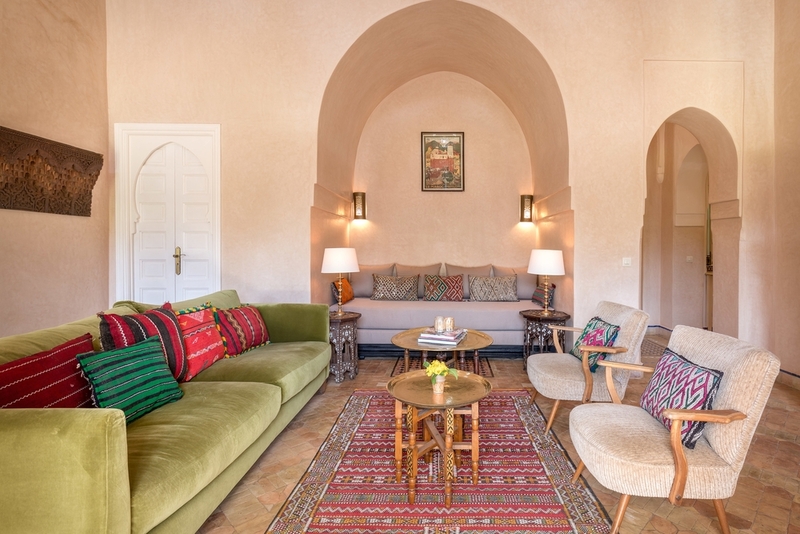 Our luxury Moroccan villa was designed by renowned architect Charles Boccara. Soak up the sun in a quiet spot within over a square kilometre of lush private gardens or cool down with a dip in our pool. Indoors, the spectacular living room with its five meter high ceiling is flooded with natural light. Unique antique and contemporary furniture has been carefully selected to give the villa a sense of calm and serenity throughout. Traditional Moroccan techniques such as 'tadelakt' wall finishes and Fez tiled floors perfectly display the souk and market finds that are featured in each room. 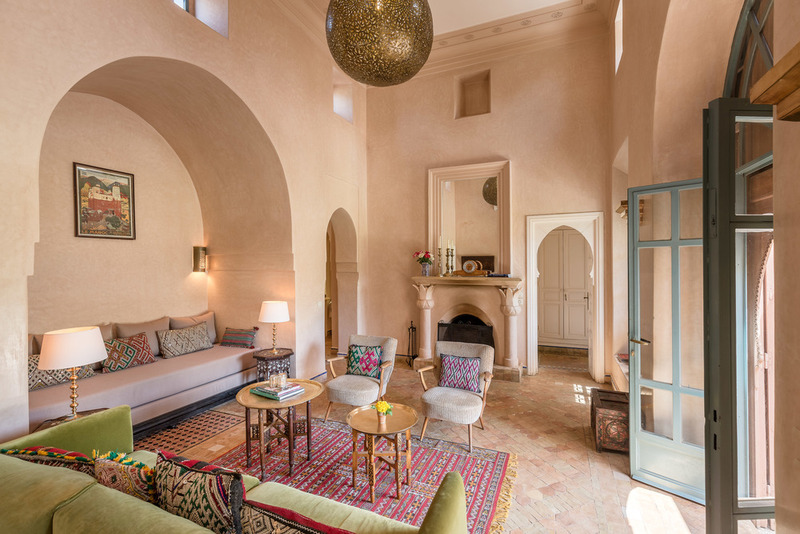 A small traditional Moroccan alcove-style living room known as a b’hou, opens onto the gardens through chic French doors. Each bedroom is tastefully decorated in its own unique style. All bedrooms have their own ensuite bathroom stocked with organic toiletries and individually controlled heating and air conditioning. If you are coming with a friend or two please let us know who, so we can make sure you are all in the same room! 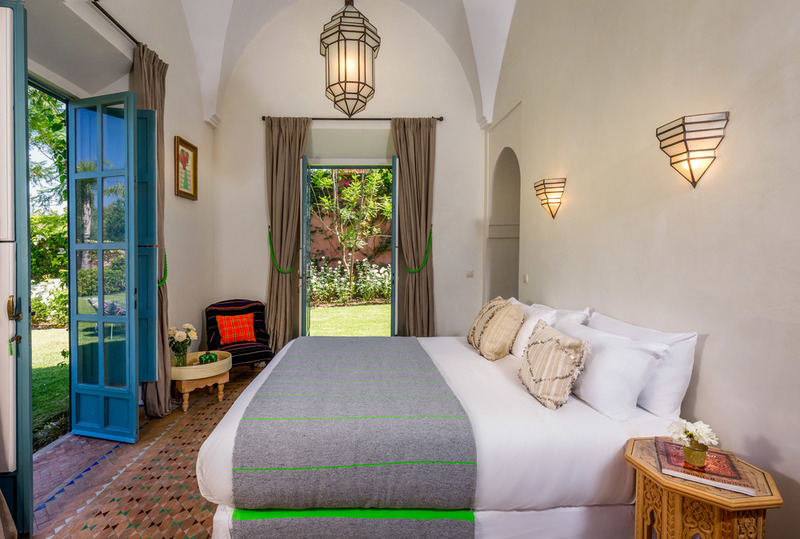 Our villa sits just outside Marrakech, a 20 minute drive away from the famous Jemaa El-Fna square and its colourful souks. It is perfectly placed for day trips into the city, or for exploring the nearby Atlas Mountains and stone deserts. Take a day trip into Marrakech city to explore the colourful souks, wander through the maze like medina quarter and pick up a bargain at one of the myriad market stalls. Relax with a book in our gardens or cool down with a refreshing dip in the pool. Maybe choose to indulge in a massage at our villa. On our last evening we will venture into the stone desert surrounding Marrakech for sunset yoga, dinner in the wilderness and stargazing after dark. Our early bird prices are available now for bookings made before 30.04.2018, and you can secure your spot now with just a 25% deposit. You can choose to have your own room, to have your own bed in a shared room, or to share a kingsize bed with your partner or bestie. Our last retreat sold out more than 6 months in advance so don't delay! NB. Where a deposit is paid, the remaining balance is due by 12 August 2018. Payment plan available upon request. Click on the 'book now' button above. After login make sure you are in the 'classes' tab, then use the little calendar to navigate to 28 September 2018. Click 'sign up now', then 'make single reservation'. Then choose the room type you'd like to reserve and follow the steps to payment. If you are coming with a friend you each need to book your space individually. But let us know and we can make sure you are in the same room! Arrive on Friday 28 September and depart on Monday 1 October 2018.
lunch (we find that after a big brunch and with a substantial dinner in the evening guests prefer a very light lunch. Fruit, nuts and soft drinks will be available all day. You can easily pick up a snack on a day trip, or shop for wonderful local fruits and vegetables or fresh bread and prepare them in our own kitchen during the day). There are non-stop flights from London to Marrakech with Ryainair, Easyjet and British Airways. There will be a group taxi transfer to our villa departing Marrakech airport on the day of arrival. Transfers will cost €15 per person for a return trip. 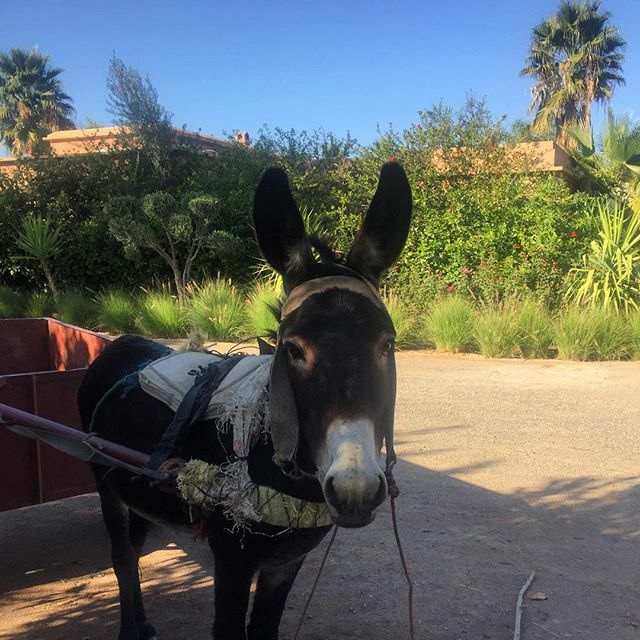 Our villa is just a 30 minute drive from Marrakech airport. Each person will need to reserve their space individually so that we have their details. But of course if you let us know when you have both booked we will do our best to make sure you're sharing. We have both twin and triple rooms. You can always drop us a line to check on availability beforehand if you want to make sure! Numbers will be limited to a maximum of 15 people, so lots of opportunity for individual attention. Please be aware that our last retreat sold out 6 months in advance, but you can secure your spot now with just a 25% deposit. Click here to use our online booking system. After logging in make sure you are in the 'classes' tab, then use the little calendar to navigate to 28 September 2018. Click 'sign up now', then 'make single reservation'. Then choose the room type you'd like to reserve and follow the steps to payment. If you would like to share a room with someone else who is booking please let us know!